Managing your financial goals is just one click away! Say hello to ClickGoals. The financial planning and investment management landscape is changing. Isn’t it time you changed with it? We created ClickGoals to bring financial planning and investment management services to self-directed, goal-minded individuals who are motivated to accumulate wealth. Consolidate all of your financial accounts. 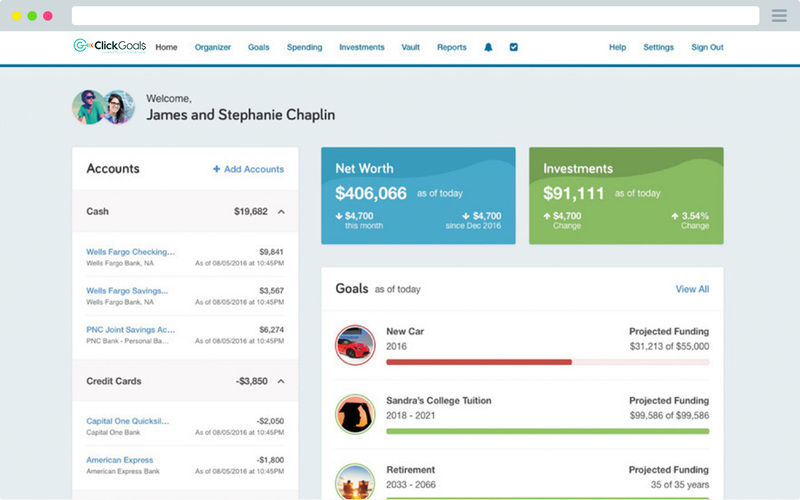 A financially organized investor is a better investor, and ClickGoals is designed to help you get your accounts organized by storing all of your important financial documents in one place. With our secure document vault, you’ll have unlimited storage and a secure way of exchanging documents electronically. Manage your budget efficiently. Income and expenses are automatically categorized for you, and you are even able to create your own categories for further personalization. Set goals and make a plan for achieving them. A wide array of selectable goals are available out of the box, including retirement, education, and major purchases like a home or automobile. Additionally, you can create customized goals unique to you. Invest wisely. We have created portfolios covering a wide section of the market. Nothing fancy here—just low cost, market-based investing. There are no trading charges, and internal fund expenses (included in your monthly subscription fee) are a fraction of the standard cost. Receive financial coaching and project-based financial advice from our CERTIFIED FINANCIAL PLANNER™ professionals at a reasonable rate. Our financial coaches are standing by to help you get financially organized, upload documents, set your goals, manage your budget, and select portfolios. Additionally, because all your information is up to date and in one place, our financial coaches can help you access one of our CERTIFIED FINANCIAL PLANNER™ professionals for project-based advice when you need it at the reasonable cost of $97 per project.